Challenger is from Alabama and just celebrated his second birthday in January. We recently removed Challenger from our Heartfelt Hounds service dog program. Although he had a great evaluation, he became too anxious at the training center. He is awesome in a home environment. He is playful, sensitive, and redirects easily. He has a high potential of living with cats and small dogs. He thrives off social interaction with people and other dogs. 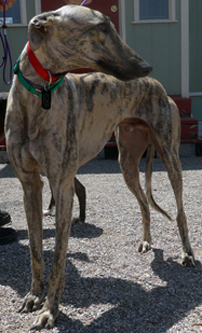 Challenger would love to find a forever home!